The Kamehameha crypt at the Royal Mausoleum was guarded by replacement staffs in this photo taken on Friday. The original sacred staffs, which feature golden orbs, were returned two days ago after being missing for about five years. The Royal Mausoleum has welcomed back two sacred staffs that were borrowed five years ago, never returned and believed stolen, according to the mausoleum caretaker. "I am just so grateful that they are back at Mauna Ala where they belong," said William Kaihe'ekai Mai'oho, the sixth generation of his family to serve as kahu, or caretaker, of the Royal Mausoleum in Nuuanu Valley. The 3.5-acre site is considered sacred by many Hawaiians as the final resting place of most of the high chiefs of royal families. 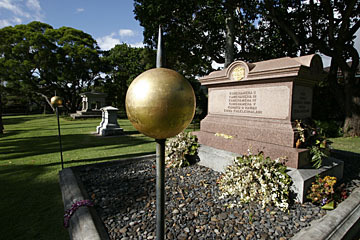 The staffs topped with golden orbs had watched over the crypt of the royal line of Kamehameha for more than 113 years. In a Sunday article in the Star-Bulletin, Mai'oho said that in 2000 he made a "good-faith loan" of the staffs, or pulo'ulo'u, to Kunani Nihipali, who was then the po'o, or director, of Hui Malama I Na Kupuna 'O Hawaii Nei, a controversial group that repatriates native Hawaiian remains and funerary objects from museums and protects native Hawaiian grave sites. After five years of inquiring after Nihipali and the missing pulo'ulo'u, Mai'oho "reluctantly" told the Star-Bulletin last week that he believed they were stolen. In an interview yesterday, Mai'oho said that early Tuesday afternoon, Nihipali brought the pulo'ulo'u back to Mauna Loa. He said the staffs were wrapped in heavy clear plastic bound with gray duct tape and wrapped in movers' quilts. He showed the pair to the Star-Bulletin where they stand in his house on the grounds of Mauna Ala, until he can find someone to restore them. Nihipali could not be reached for comment. Mai'oho said that Nihipali told him he did not like the Star-Bulletin story and that many people who had read it had contacted him. Mai'oho said Nihipali told him it was all a "misunderstanding" and that he did not agree with Mai'oho's recollection of the loan. According to Mai'oho, Nihipali said that the agreement was he would store the pulo'ulo'u at his home until they could find someone to restore them. Mai'oho said he asked Nihipali to sit down and discuss the differences in their memories with the Star-Bulletin but that Nihipali declined. Charles Maxwell, president of Hui Malama, said yesterday that the Star-Bulletin story was "all innuendo that was not substantiated by fact." "Your article was like saying that Elvis Presley is buried in Forbes Cave," Maxwell said, referring to a famous burial cave on the Big Island. "Of course, we are very happy that they (the pulo'ulo'u) are back," he added. Last week, Mai'oho told the Star-Bulletin that in 1999 or 2000, Nihipali and George "Billy" Fields, a Big Island mason who has done about 50 projects with Hui Malama, were consulted about restoring the pulo'ulo'u, which had stood in front of the crypt as a guardian and symbol of royal presence since 1887. Mai'oho told the Star-Bulletin that the two said the pulo'ulo'u could not be repaired and that it would be easier and cheaper to make new ones. The day they installed the new pair, Mai'oho said Nihipali asked to borrow the original pair. Mai'oho said Nihipali told him that Hui Malama had reclaimed ancestral bones from the Bishop Museum that had been taken from Kamehameha lands and not yet been properly reinterred and that he wanted the pulo'ulo'u to watch over the bones until they were reburied. Mai'oho said he "loaned" the pulo'ulo'u to Nihipali because "of the connection with the Kamehamehas." Mai'oho said, "I took his word that he would return them. I told him that I wanted them returned to Mauna Ala because that is where they belong." He noted that nothing from Mauna Ala, including the dirt, ever leaves because it is sacred and belongs there. Mai'oho said that each year he has made inquiries after Nihipali but has been unable to track him down. He said he did not want to go to the police because it was a matter between him and Nihipali. He told the Star-Bulletin about the matter last week after hearing rumors that the pulo'ulo'u had been buried in a cave and that he might never get them back. "Only two days after the story ran, the pulo'ulo'u are back at Mauna Ala where they belong," Mai'oho said. La'akea Suganuma, a practitioner of Hawaiian martial arts and a critic of Hui Malama who is suing them over items from Forbes Cave, said, "I am glad they are home again. ... I think the community is happy." Lurline Naone-Salvador, who worked for Kamehameha Schools for 29 years and through her work with the Charles Reed Bishop Trust worked closely with Mai'oho on restorations at Mauna Ala, including the Kamehameha pulo'ulo'u, affirmed Mai'oho's version of the loan. "It was definitely a loan," she said. She said that in 2000 she visited Nihipali at his Pupukea house and saw a wooden shed behind his house that was specifically built with shelves to hold the bones. She said that when she opened the door to the shed, "I saw the pulo'ulo'u with my own eyes." She said that Nihipali told her they were a loan until the bones were reburied. Fields also told the Star-Bulletin last week that his understanding was that it was a loan. Fields said that he was not a member of Hui Malama. "I don't understand the political rhetoric. I am just a builder," Fields said last week.